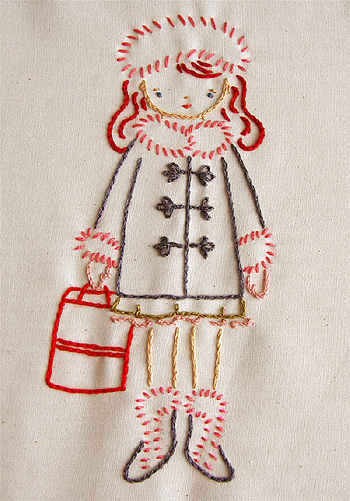 Here’s the third Winter Stitchette, Parker’s Purchases. I didn’t make it down to Michigan Avenue during the holidays like I’d hoped to, but Parker was there. Parker looks adorable in her toggle coat with fur trim. It’s always a good day when you can find something on a shopping expedition. Looking forward to seeing Charlie. definitely my fave of the winter set! and the name ‘parker’ suits her perfectly. oh look at that coat! i want one just like it! Just adorable! I love her name! Ooh, I just love this one! Tomorrow, Charlie. Is that Chicaganese for “Later, Gator”? Just loving the stitchettes, loving the Tomorrow, Charlie. Like the new webdesign, too, though I see as I comment that the old house is still here. She’s my fave of this group so far. Thay are so fabulous! I’m getting behind on stitching them though, I got sidetracked by the adorable christmas ones. I love the little hem of her dress peeking out. So cute. absolutely adorable! i see a whole childrens book based on these adorable characters! your stitching is so nice! Very, very cute…makes ME want to go shopping! Not that I need much incentive for that! Parker is adorable. Can’t wait to start. And pray tell, what will you do with the Winter Stitchettes once they are all complete? She’s so elegant and chic! I love them all. You are so clever. I’m using my summer and autumn stitchettes all the time – my current “new baby” present for all the babies I know! I love Parker! Love the coat, love the boots, love the hat, LOVE that she has red hair. She’s adorable! The site redesign looks great too! what a lovely stitchette! and the new blog colours look very elegant! This one is really really cool. I can’t wait to see tomorrow’s stitchette. Just so fun. Parker is so cute! The Winter Stitchettes are just as fabulous as the other sets. I’m hoping you offer these for sale soon…unless I’m so befuddled in my massive crafting to-do lists that I’ve missed the whole thing. Sooo adorable! I love the ruffly dress peeping out. And a toggle coat–Parker is one stylish Stitchette. Parker’s furry hat, collar & cuffs (boots, too) are so cute. I like the new Wee Wonderfuls look as well. btw, just got my space boy pattern in the mail the other day and can’t wait to get started! oh oh! when will we be able to make our own? you are creating serious demand with these glimpses of total cuteness. can’t wait to see charlie too! Love these! When will we get to begin? I love her little frog buttons, can’t wait to get my hands on these. I better queue up some good flicks so I can veg out in front of the TV with these! I like the simple look of your layout, the yellow was to much.